First quarter real GDP came in at 0.7% vs an Econoday consensus estimate of 1.1%. Consumer spending was the weakest since the 4th quarter of 2009. The weakest showing since the last recession for consumer spending held down first-quarter GDP which could manage only a 0.7 percent rate of annualized growth. Consumer spending rose at only 0.3 percent which is by far the worst showing since no change in fourth-quarter 2009. Weak vehicle sales are a major negative in the quarter’s consumer breakdown, pulling durables down at a 2.5 percent rate and offsetting a 1.5 percent rise in non-durables and a slow 0.4 percent showing for services. Weakness in consumer spending is strongly associated with recession but not other data in the report. At a 13.7 percent pace, residential investment posted a second straight very strong quarter. And in a rare show of strength, nonresidential investment, which has been subdued, jumped at a 9.4 percent rate with both structures and equipment showing unusual strength. A surge in mining investment is a standout of the report. The net export gap narrowed slightly which was a small plus for the quarter while a drop in government purchases was a negative. A sizable negative for the quarter was a slowing in inventory build, pulling GDP down by 0.9 percentage points but also keeping in check what may be unwanted stock given the weakness in consumer spending. Looking at final demand, which excludes the inventory effect, final sales rose 1.6 percent which is an improvement from the fourth quarter’s 1.1 percent. This is a mixed report with the weakness in consumer spending not fitting with the strength in investment. Still, all the sky high confidence readings in the quarter did nothing to help actual spending. In other data, prices show pressure with the GDP price index at 2.3 percent for a 2 tenths gain and the core also at 2.3 percent for a 5 tenths gain. Let’s tune into the BEA News Release for more details. The deceleration in real GDP in the first quarter reflected a deceleration in PCE and downturns in private inventory investment and in state and local government spending that were partly offset by an upturn in exports and accelerations in both nonresidential and residential fixed investment. Current-dollar personal income increased $161.9 billion in the first quarter, compared with an increase of $154.6 billion in the fourth. The acceleration in personal income primarily reflected an acceleration in government social benefits to persons that was partly offset by a downturn in personal dividend income. Disposable personal income increased $121.0 billion, or 3.4 percent, in the first quarter, compared with an increase of $141.6 billion, or 4.1 percent, in the fourth. Real disposable personal income increased 1.0 percent, compared with an increase of 2.0 percent. Personal saving was $814.2 billion in the first quarter, compared with $778.9 billion in the fourth. The personal saving rate — personal saving as a percentage of disposable personal income — was 5.7 percent in the first quarter, compared with 5.5 percent in the fourth. The Federal Reserve Bank of New York needs to do some serious work on its model as I pointed out in advance. See Six GDP Estimates (Three Revised Today): ZeroHedge, Mish, GDPNow, Nowcast, ISM, Markit. Nowcast uses no hard auto data: This is a serious error. Autos account for 20% of retail sales and fleet sales are also very important. Nowcast has an incorrect reliance on unemployment rate: People dropping out of the labor force and actual employment rising can both move the number in the same direction. Both things cannot mean the same thing. ISM vs PMI: Both reports measure the same thing, yet those reports signal very different things. At least one of them is wrong. 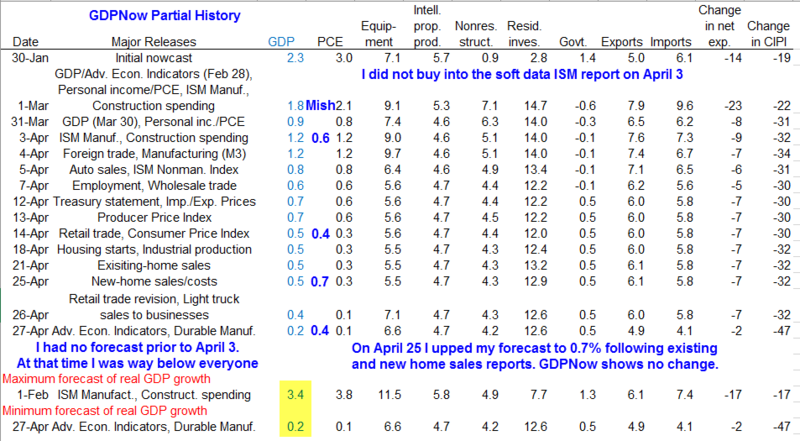 GDPNow and Nowcast both rely on ISM even though the PMI reports have been more accurate, at least recently. The GDPNow and Nowcast models both suffer from an inability to think. The weather provides a nice example. In December, the weather was unusually cold, causing Industrial Production numbers to soar (heat and electric production), for the entire upcoming quarter. I estimated in advance, January would take away those numbers. My assertion played out, at least for GDPNow. I still cannot account for Nowcast. On April 3, on Coast-to-Coast, live syndicated talk radio, I told George Noory I expected GDP would be 0.6%. On April 25, following the existing and new home sales reports I up my forecast to 0.7%. The FRBNY Nowcast was heavily influenced by soft data including the ISM reports. The other major error was a complete omission of hard auto data. Econoday and other sources keep touting strong consumer sentiment as if it means something. It’s time to throw that idea in the ash can where it belongs. March 28: Consumer Confidence Strongest Since December 2000: A Strong Contrarian Indicator? Can't wait to hear how economists explain the highly confident, non-spending consumer. We saw this starting in February. We have 4 online stores, an Amazon store and an Ebay store. Business is down over 50% and the worst hit is our Amazon store. We were averaging 5 large sales a day and now are lucky to do 3 in a week. Something is happening out there and it isn’t pretty. I have dealers that aren’t placing orders either. When this happens we immediately think that our sites are not getting traffic, but how can an Amazon store not get traffic? People are running out of money fast and stopped spending. It seems that after Trump was elected, the spending stopped. Obamacare tax, Obamacare tax, Obamacare tax. Plus many Trump supporters have ended doing business with Amazon. (1) Obamacare took away all discretionary spending money — the underlying cost structure effects everyone including those getting health insurance thru an employer (which means it gets subtracted from your total comp). (2) Too much debt in the system, without the income to service that debt. Obamacare will only reduce the income available to service debt (see rising defaults at Capital One for example). You did good Mish, Very good. But after Trump was elected, everyone was in the throes of Trumphoria? The Messiah was here to save us all and we were so happy! It must be fake news! Bah humbug! Big media called it Trumphoria. Big media also thought Hilary would steal… um get… 85% of the vote, despite (or maybe because of) her illegal activities. Yeah, Big Media and Hillary Democrat Party planned on Stealing it the Biggest Evah! Well, DJT took credit for stock market rise since he got elected … will he take credit for Q1 GDP?? The first quarter due to seasonal adjustment has always been on the low side. Let’s see what happens in the next upcoming months. I have learned my lesson from listening to Perma-Bears who always claim the sky is falling. Such is not the case. Sorry you’ve lost money … but I learned long ago the markets and the economy are 2 entirely different animals. The focus here is economics and not trading. But, hey, go back to CNBC and their “experts” who proclaim 3% to 4% growth just right around the corner. The entire wall street economy is fake. Look at CAT’s earnings. They lied to the 10th degree about their earnings claiming $1.48 when their real GAAP earnings were 32 cents. The whole system is a fraud and there is no SEC to impose any rule of law while wall street runs the country. I looked at Amazons earnings last night and their cloud service missed the sales mark by over 10%. Their retail division brought in $110 million on $21 billion in sales. There are no more margins because Amazons business model destroys margins. Seasonal adjustments are total BS. Until you have to run a business in the real economy, you don’t have a clue about reality. I am betting that this GDP number was doctored to be higher then reality. Everything seems to be FAKE. Some parts of GDP are growing — overpriced health care high on the list… but there are some pockets of strength (not enough, but some exist). other parts of GDP are flat or shrinking — the debt binge has reached a point where it must increase exponentially faster and faster to have even the same impact as last year, but the income to service that exploding debt does not exist in the US or anywhere else. Ergo, the debt binge is over unless income explodes as well (something no one is anticipating in the near future, not even the most bullish / optimistic). A lot of discretionary items are being crowded out by Obamacare, which still has not been repealed despite Paul Ryan and the spineless ones having already passed a bill for full repeal just last November. Either Ryan is all show, no substance for the November stunt… or he is lying that he can’t get the same bill passed right now…. or he is a spineless twit both last November and now. Imagine the weak economy that we have had the past few years, and ask yourself what happens if Obamacare is allowed to steal another 30% yoy increase? (note that the same underlying cost structure effects healthcare received from an employer too). Obamacare will get repealed or the economy will go into serious recession next year. Paul Ryan and Nancy Pelosi will be blamed for the recession if Obamacare doesn’t get repealed. You keep repeating that Obamacare is going to get repealed like it’s your mantra. There is so much wrong with American healthcare that it will never be rectified regardless of whether Obamacare gets repealed or not. We spend the most in the world on healthcare and get the least in terms of life expectancy. Like everything else in America, healthcare is NOT about health and wellness for Americans – it’s about big profits for big pharma and big HMOs. Health care needs to get fixed, and that becomes impossible to do when large parts of it are locked in legislation. I don’t care if it offends you, Obamacare will get repealed and there is nothing you can do about it. The country can’t afford to keep it. Maybe Congress comes to their senses, maybe the federal government goes bankrupt — or maybe Congress doesn’t understand the problem but gets scared enough to repeal it. In the meantime, I assume people like you will whine endlessly about big pharma conspiracies. Yesterday one of your left wing friends decided I was pro coal because I pointed out the electricity has to work — and if you rule out coal and nuclear and oil and … you have a blackout. I don’t care how offended you get. Grow up and understand that the laws of physics take precedence over all legislation. The king can order the tide not to come in, but the tide isn’t going to obey. Obamacare will get repealed, and the economy will get much much much worse until it does. I don’t get it. I live in a suburb of Detroit and there are help wanted signs everywhere. There is a labor shortage. New home prices are ridiculous courtesy of the incompetent fed but used home prices I think are a bit soft which I don’t geteither . Certain price ranges sell quick however. GM just posted good earnings and sales increase. Either Mi is isolated from this so called slow down, or govt figures are deliberately understating GDP just like the CPI in order to justify low interest rates. I don’t know what it is but something somewhere doesn’t make sense. There is a labor shortage in the US. In particular a labor shortage of highly skilled workers. And it isn’t just Detroit. It’s all over. In Vegas they can’t find skilled construction workers no matter how much pay they offer. A lack of skilled workers is actually a drag on economic growth as it prevents businesses from expanding. That’s one of many reasons that I am convinced that US growth will stay stuck between 1-2% for the next four years. If you want economic growth you will need to open the floodgates and bring in a lot of skilled immigrants to fill all the jobs that currently are going begging. Or you will have to automate everything at a much faster pace. As I have said many times, growth will improve in 5 years as autonomous vehicles drastically improve productivity. You are probably the only person in the entire country who thinks there is a labor shortage. I know tons of people in STEM fields who can’t get jobs. It’s all outsourced to the Indians here (H1B) or Indians in India. “Ability to balance a checkbook” disqualifies the entire state of California (as well as the US Congress and many other locales). Blue collar tasks like plumbing, electrical work, construction, mechanical repairs — all involve getting dirt on your hands and solving problems for demanding customers (they are the ones paying the bill)… that rules out Obama’s free sh!t army. “Must be able to show up to work on time… clean and sober” disqualifies so many recent college grads it is frightening. For $50K plus per year, what are you snowflakes learning in college? 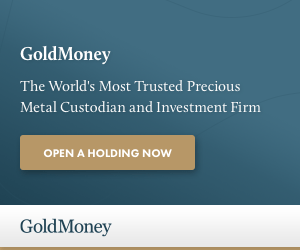 A former FED insider who warned the FED about the housing bubble and wrote the book “FED UP”, apparently says auto is going to bring on the next crisis. In a programming note, she is appearing on the Glenn Beck radio show today. neither ISM or PMI, which are opinion surveys, have any input into the BEA’s GDP figures..